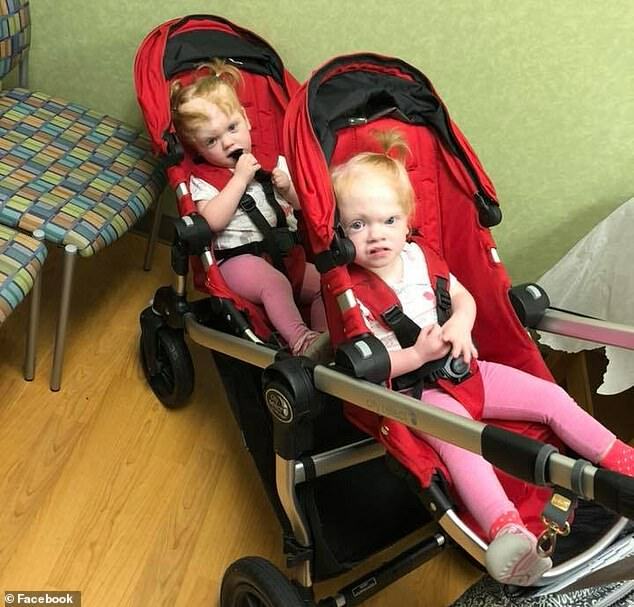 Two-year-old twin girls who were born connected at the brain are thriving after their separation surgery. Erin and Abbey Delaney underwent a risky 11-hour procedure in Philadelphia in June 2017 and were among the youngest separations ever recorded. The girls are now back with their parents in Mooresville, North Carolina, undergoing developmental therapy to improve their motor and speech skills and finally learning to eat on their own. ‘We want to make sure they know that they’ve come so far,’ their mother, Heather, told PEOPLE in a recent interview. When Heather and her husband, Riley, were excited to learn in January 2016 that they were expecting a baby. But things quickly took a turn for the worse when they visited the doctor for the first ultrasound. 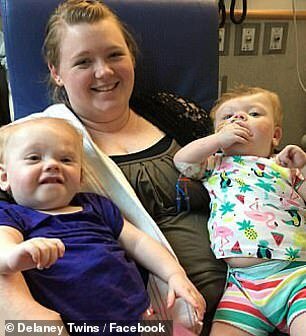 He told the Delaneys they weren’t having just one baby, but two – and they were conjoined at the head. 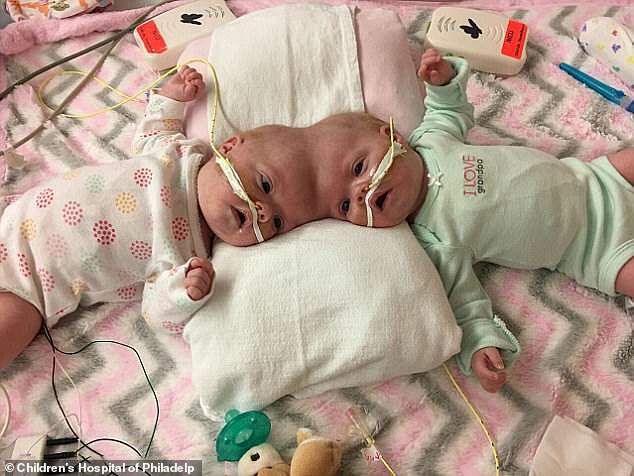 The girls were born on July 24, 2016 at Children’s Hospital of Philadelphia via Cesarean section as craniopagus twins, which are twins who are joined at the head. They were attached at the top of the skull, which is the rarest form of conjoined twins. 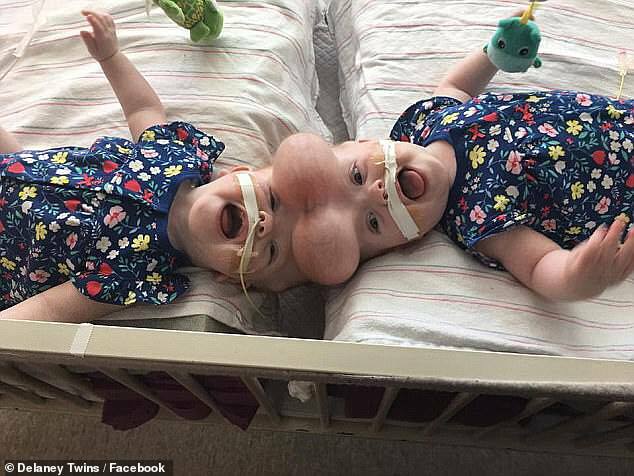 Craniopagus twins occur in 10 to 20 in every million births in the US. Approximately 40 percent are stillborn and about 33 percent die after birth, normally due to organ failure or abnormalities. 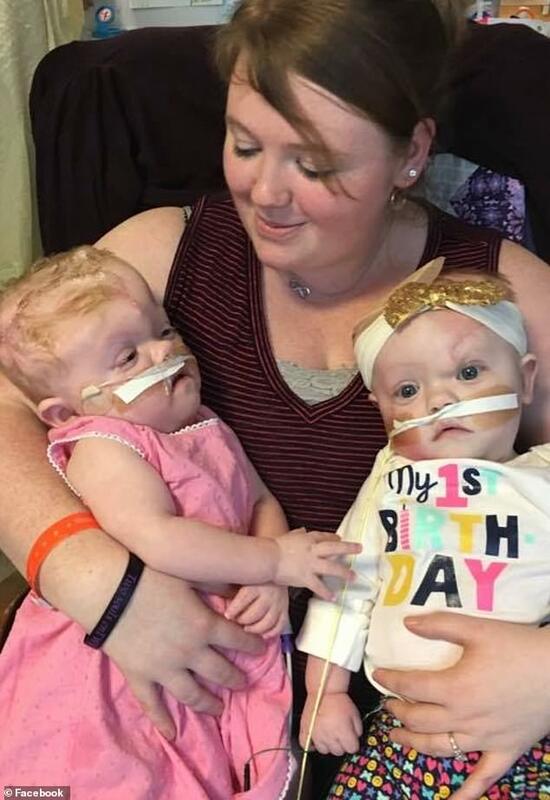 Doctors warned Heather and Riley that separation surgery could kill one or both of the twins. 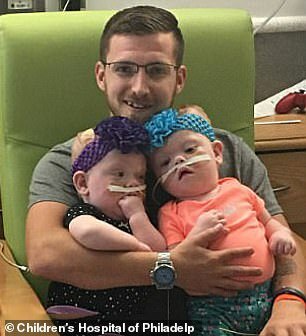 Lead neurosurgeon Dr Gregory Heuer and his team inserted a balloon into the twins’ skulls to help expand the skin before the separation surgery. 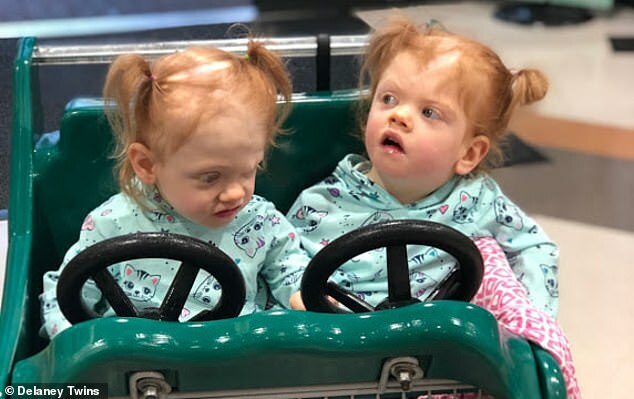 After months of planning, a team of 30 surgeons, nurses and staff separated the twins on June 7, 2017, when they were 11 months old, making it one of the earliest separations of craniopagus twins ever. ‘A lot of the time one of the twins who are connected this way dies in surgery,’ Dr Heuer said. One infamous case was that of Rodney and Roger Brodie who were born in Illinois in 1951. A medical team attempted to separate the pair, but the boys shared this blood vessel. Rodney Brodie retained it. Roger did not regain consciousness and died 34 days after the surgery. This was the first case where craniopagus twins were separated and one survived. In this case, Erin received the sagittal sinus – but both girls survived. Both twins were put into an induced medical coma for a week after the procedure to help their brains recover from the separation. Erin’s coma was lifted first and Heather was able to hold her for the first time. To prevent this from happening, hospital staff washed Erin’s brain once and Abby’s twice to keep the area as clean as possible. She has suffered from a brain bleed, three respiratory viruses, a blood infection and other complications that kept her in the hospital longer. Right before Thanksgiving, the girls were cleared to home. ‘It lifted our spirits. We’re so grateful,’ Riley, 26, told PEOPLE. Today, the girls attend developmental therapy three times a week and have a home visit with the therapist once a week. 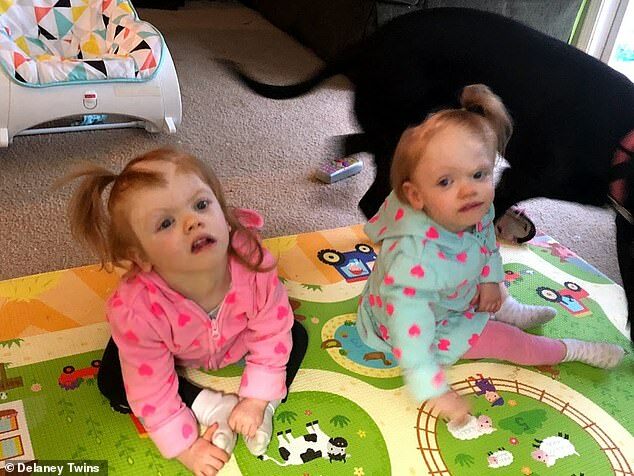 Erin began crawling in July 2018 but Abby has not yet. ‘They’re delayed in some ways because of how long they were conjoined, but we’re hopeful they’ll make up for lost time,’ Riley said. 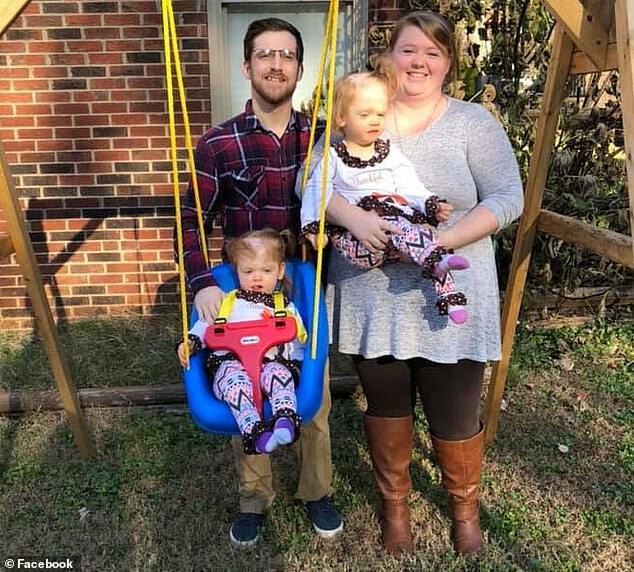 The couple told PEOPLE that the girls are currently fed through gastrostomy tubes in their abdomens but the parents say the therapist is teaching them how to eat on their own. Another recent milestone: Erin just learned how to say ‘Dada’. The Delaneys have started a GoFundMe page to help cover the cost of medical bills and expenses for follow-ups in Philadelphia. So far, more than $33,000 has been raised out of a $100,000 goal.